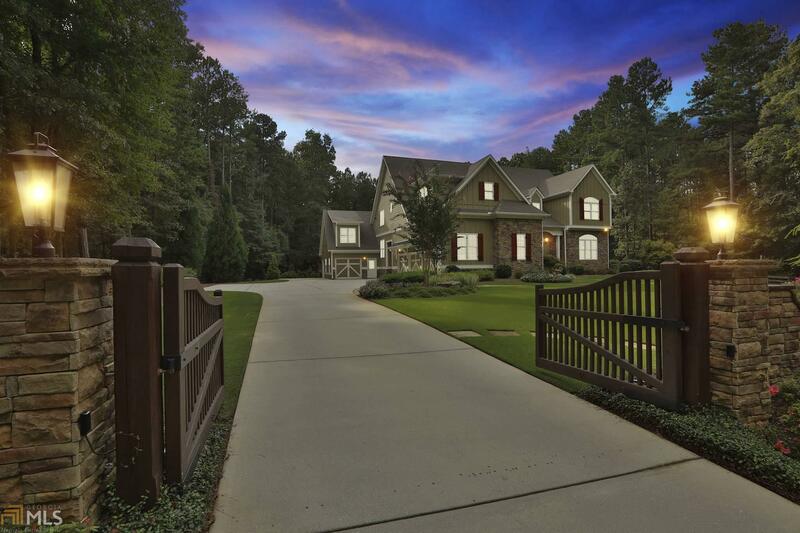 Enter the gated entrance and manicured landscaping and you'll discover relaxed refinement at this masterfully-decorated custom home. The foyer opens to the dining room, while the living room with stacked stone fireplace creates a cozy gathering spot. The chef-inspired kitchen has high-end appliances, an oversized island, farm table & walk-in pantry. The owner's suite on main features a hand-crafted fireplace, screened in porch with iconic views, dual closets and a Ritz-Carlton-inspired bathroom. The second level features 3 bedrooms each with ensuite baths, a craft nook & a loft/game room. The terrace level has a theater, gym/rec/living area, kitchen, bedroom and bath. The outdoor living oasis includes a Pebble Tec pool, hot tub, fire pit, waterfall & stream. Directions: From Fayetteville, Head West On Highway 54, Turn Left On Ebeneezer Rd, Turn Left On Quarters Rd, Home Will Be On Your Right. From Peachtree City, Head South On 74, Turn Left On Redwine, Turn Left Onto Quarters Rd, Home Will Be On The Left.